Born in the 15th Century Vlad the III was the Prince of Wallachia, he fought against the Ottoman Empire before being killed in battle in 1476. Because of the atrocities he committed he was also known as Vlad the Impaler and was one of the inspirations for Bram Stokers book Dracula. I began my Dracula tour at Bucharest airport in Romania where the coach collected everyone and took us to our hotel. I did consider doing the trip myself but with a guide you learn far more about the country’s history and Vlad the Impaler then you would on your own. You will also go to places that you may have overlooked or would never have known about without local knowledge. 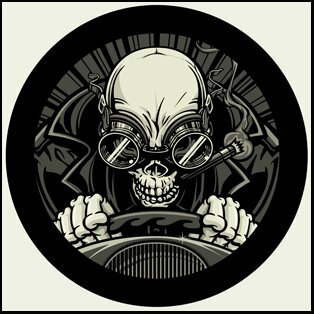 The company Drac Tours is based in the USA and runs trips twice a year. 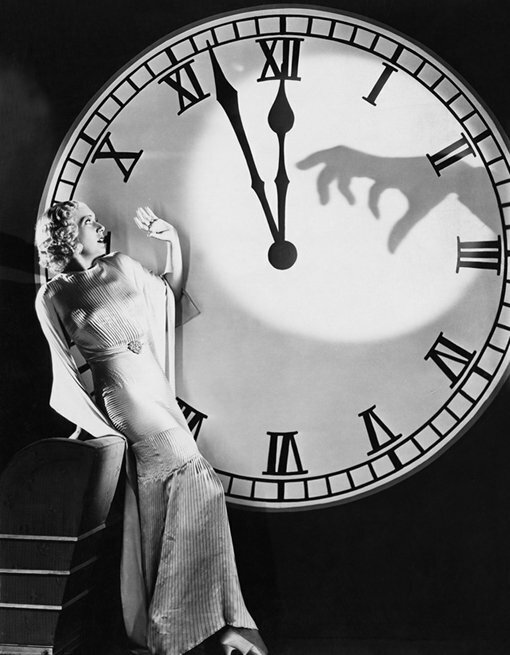 I decided to take the one over Halloween, after all if you’re travelling to Transylvania what other time would you go? There were around 20 of us in the group mostly from the States, and Canada and they are people of all ages and backgrounds. If you expected everyone on these tours to be Goths you would be mistaken. The first night we went into old town Bucharest where several years ago Vlad the Impalers palace had been uncovered by archaeologists. 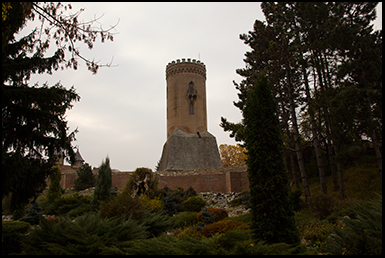 Aside from the extensive ruins there is one of several statues of Vlad the Impaler which we would encounter over the course of the tour. In Romania he isn’t considered a villain but a national hero. However the fictional association with Dracula is undoubtedly good for business. Bucharest is an interesting mix of stark communist era architecture sitting alongside ancient historical buildings and if you are in search of Dracula you will probably be passing through or near it on your travels. The next day we set off for Snagov Island which is the alleged burial site of Vlad the Impaler. It’s about an hour’s drive from Bucharest and in a more rural part of the country. Once we arrived it’s a short walk down a narrow track until you can see the island on the other side of the lake. When I first read about Snagov many years ago it was only accessible by rowboat, but now a bridge has been built to it. This has without doubt taken away some of the mystique but it has made it more tourist friendly. Being rowed across the lake in a small boat through the mists to the rotted corpse of Count Dracula would have made it a different experience. However as you cross the bridge you can see the monastery rise up through the trees and the islands isolated location still gives it a somewhat mystical aura. There is a building with an arched gateway which you walk through first before you get to the main structure with its 3 towers. The monastery dates back to the 14th century and the surrounding grounds are well maintained and the grass recently cut. Apart from our tour the only other person on the island is the monastery’s priest, there is a fee for visiting which contributes to the running cost and this has already been negotiated by our tour director. I explored the island for about 20 minutes and took a few pictures before entering the chamber where Vlad the Impaler is buried. Whether he is really buried here or not is uncertain. But if he is this would be a fitting place for the “real” Count Dracula’s final resting place. 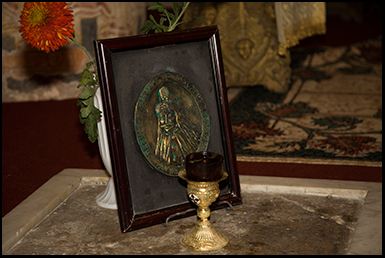 The walls of the monastery are painted with vivid depictions of religious figures and in the center of the building beneath the vaulted ceilings is a stone slab in the floor with a portrait of Vlad the Impaler placed in the right hand corner. During a previous excavation archaeologists found some bones under it but it hasn’t been determined who they belonged to. Everyone lined up to have their pictures taken in front of the grave. Afterwards I took another walk outside, the exterior of the monastery is a red brick and there are few windows in it. At the far end of the island there is a well and a few rose bushes and beyond the grass areas, trees lead down to the banks of the lake. Soon it’s time to cross back over the bridge and head back to the coach. I remember first reading about Vlad the Impaler and Snagov monastery over 30 years ago and it’s quite an experience to finally make it here. Even if I didn’t come across by rowboat. Next on the stop was Bran Castle often referred to as Dracula’s Castle, not because Vlad the Impaler stayed there for any significant length of time but because it looks like a castle Dracula may live in and it is also a lot more tourist accessible than the actual Dracula’s Castle. Originally the plan was for us to visit it during the day but our tour director had arranged for us to visit at night as during this time of year it is host to one of the largest Halloween parties in Romania. We checked into the Hotel in Brasov and at about 7 pm we headed out to Bran Castle. Even from a distance the first glimpse of it is quite impressive. Illuminated, and sitting on top of a hill it is visible from the coach from over half a mile away. As we arrived at the castle there were already hundreds of people waiting to get in. Fortunately our tour guide had arranged for us to by-pass the line. There are few Halloween parties in the world that will surpass one held in Dracula’s Castle, Transylvania. Once through the entrance there is a steep path that you follow up towards the base of the castle and on the way you pass numerous people in fancy dress, and as you might expect many are dressed as Dracula. The castle is lit up with spotlights that flow up the white walls to its pointed turrets. Across the tops of the ramparts are thick wooden beams that lead out from under tiled red roofs. 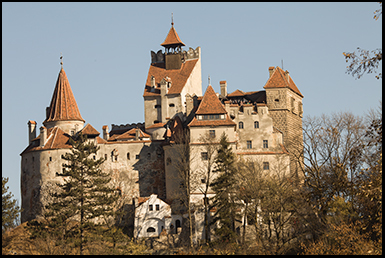 Bran Castle looks like a classic version of a Walt Disney castle, in fact in 2015 the Walt Disney Company purchased it when it went on the market. Only time will tell if this will be of benefit or if it will become over commercialized like one of their theme parks. When you reach the castle entrance you enter the main courtyard via a series of wide stone steps. Once inside, as you would expect on Halloween it’s very dark and very crowded. 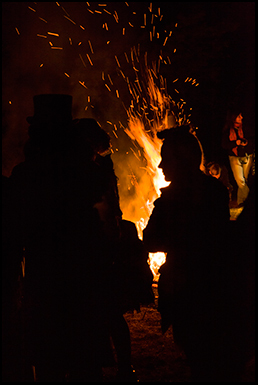 There are candle lit pumpkins and fog machines throughout, as well as a band and people in fancy dress dancing through the mist. However while I was there I wanted to explore. 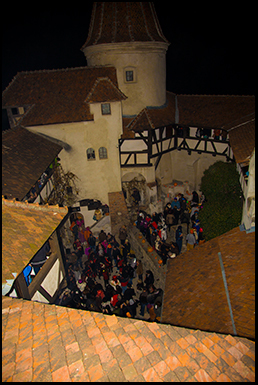 The castle is on several levels accessed by going through claustrophobic narrow passages, but with the amount of people present that night it meant that there was really only room for people to go one way. Eventually I worked my way up. Then I came across a dark stone stairway heading up to an arched doorway and all of a sudden the crowds thinned out. It was there I was greeted by someone handed out free promotional shots of Vodka. I grabbed a glass and made my way through another series of passages to the castle battlements. I looked down into the crowd below and took a few pictures. After a few more hours exploring it was time to go and head back to Brasov. Halloween in Bran Castle was a once in a lifetime experience and if you get the chance it’s highly recommended. And although it wasn’t particularly spooky it certainly was entertaining. The following morning before we left Brasov we took a trip around the 14th century Black Church which got its name from the interior being blackened by a fire. On the way to our next destination we stopped by Bran Castle again. There wasn’t time to go in but we were able to take pictures of its exterior from a vantage point along the river that ran behind it. Are next stop is Sighisoara which is Vlad the Impalers Birthplace. It’s an old medieval town reached by a steep climb up a hill. 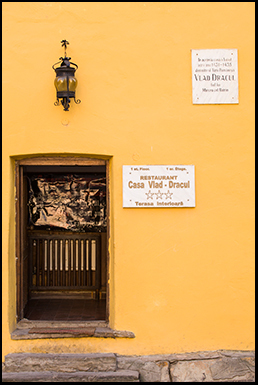 The small yellow house where Vlad the Impaler was born is now a restaurant. Standing in the doorway to welcome customers is a man dressed as a vampire. I didn’t actually go in but decided to have a look around the town square. There is a statue of Vlad the Impaler on a plinth on one of the back streets. On one side of the cobbled walkway is the 13th century Sighisoara clock tower which you can climb up. The views from above are spectacular and give you a good view of Vlad the Impalers birth place and the surrounding countryside. Below in the square a mock witch trial is carried out several times a day which you can participate in if you chose. On the opposite side of the town are what are known as the black steps. This is a covered set of a 175 wooden steps that leads up the hill towards a cemetery. As the sun started to set we explored the 14th century church at the top before we headed back to the coach. That night we continued to follow in the fictional footsteps of Bram Stokers Dracula and stayed in the Golden Crown Hotel in Bistrita. Dinner was a Halloween themed banquet complete with pumpkins and “Robber Steak” which Jonathan Harker was described as eating in the book. The next day it was October 31st and we continued onward to the Carpathian Mountains. This part of the Transylvanian countryside is comprised of green undulating hills and corn fields and on occasion you will see people travelling the narrow empty roads on a horse and cart. 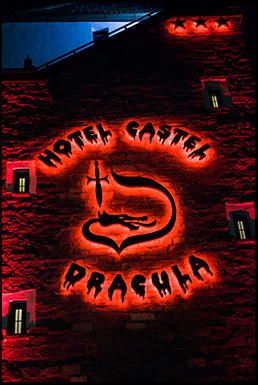 In what was another of the tours highlights we would be staying in Hotel Castle Dracula. This was built to accommodate the growing numbers of tourists following the Dracula trail, but apparently there were also the remains of a real castle here at some point. However it is now a fictional version built on the approximate location that Bram Stoker described Dracula’s Castle as being located in his book. On the next hill over is an old monastery with a huge cross in front of it that casts it shadow down the valley. As the sun starts to set the scene reminds of one of those old Hammer horror movies. Inside the hotel there is a blood red carpet with a Dracula crest woven into it and at the reception desk you can get your passport stamped to say you stayed at Castle Dracula. That evening was the night of the Halloween ball and everyone had packed a costume for the occasion, while I opted for a basic Dracula outfit of fangs and a cape I was impressed at the efforts some of my fellow travelers went to. Apparently this annual gathering is still considered news worthy enough that a local TV crew came to film the proceedings. So somewhere on an obscure Transylvanian channel I was once famous for about 30 seconds. After a few drinks we settled down at a long wood table and had dinner while various Halloween themed songs played from Monster Mash to Thriller. Then it was out into the courtyard where we gathered around a huge fire and roasted meats and cheeses. There was a full moon, and being at “Castle Dracula” on Halloween night beneath the glow of the Carpathian Mountains is one of those things which will be hard to surpass. Next day it was on to the town of Sibiu where we visited a 14th century church where relatives of both Vlad the Impaler and those that inspired the novel Frankenstein are entombed. That evening we paid a visit to one of the local cemeteries. 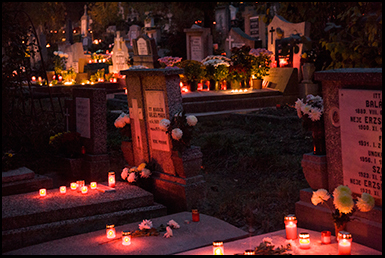 In Romania in the days following Halloween it is traditional to lite candles and place them on people’s graves. It was a spectacular site to see thousands of them throughout the cemetery as hundreds of people wandered among the tombstones. The last stop on the tour was the real Dracula’s Castle. For me this was the highlight of the trip. You could feel the anticipation in the coach start to build as we got closer to it. 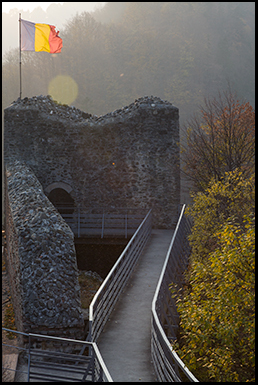 Unlike the tourist friendly Bran Castle, Poenari Fortress is quite inaccessible. It’s in the middle of the Carpathian Pass and sitting on top of a mountain, plus you have to climb up over 1400 steps to get to it. The Castle was originally built in the 13th century and extended during the time Vlad the Impaler occupied it, and although much of the structure was destroyed by an earthquake a few hundred years ago, the ruins are still impressive. I kept looking out of the window to try and spot it as the coach wound between the mountains passes. 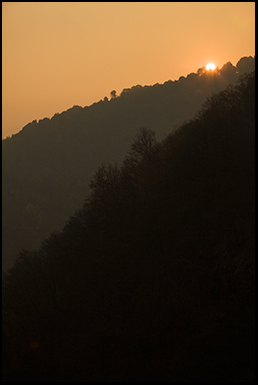 Then there it was in the distance, Poenari Fortress. But it quickly disappeared again as the road twisted away. It was hard to believe that soon we would be attempting to it reach it as it did seem a very very long way away. Within a few minutes the coach had stopped at the base of the fortress, we were the only vehicle there and unlike Bran Castle there were no market stalls selling Dracula Souvenirs. 1400 steps is not an easy climb and in addition I was also carrying a rucksack packed with heavy camera equipment. For health reasons a few of the other members of the group decided to stay in the coach. I knew I wouldn’t be the first one up, but I didn’t want to be one of the last either. Although it was bright and sunny it was still cold, but despite this I decided to leave my coat in the coach. It proved to be the right decision as half-way up many of us were starting to struggle and wearing a heavy coat would have just made the climb hotter and harder. You are actually ascending through a forest and the majority of the time you can’t see the castle because of the trees on its slopes. The steps zig-zag back and forth up the hill and the higher up you get the colder it becomes. Finally you reach the top and there is a path that leads across the edge of the mountain to where the castle is. You can see why this has never been as tourist friendly as Bran Castle. It has been a struggle to get here for most of us regardless of age or fitness levels. My main preparation for this was eating 3 snickers bars and drinking a can of Red Bull just before I got off the coach, but the effects are beginning to wear off. In front of the castle are a couple of crudely made dummies with wooden stakes through them, just in case you forgot who you are coming to see. Much of the castle was built by Vlad the Impaler using captured Turkish soldiers as slave labor and at one time it was far more extensive with roofed turrets and fully enclosed walls. The views below are far reaching, at the bottom of the gorge below there is a river and you are surrounded by mountains. The castle is in an ideal defensive position and you would be able to see your enemies advancing from many miles away. It is surreal to think you are treading in the exact same footsteps of Vlad the Impaler over 600 years after he roamed these same battlements. At one time you could camp here overnight and I have read several accounts from people that claim to have witnessed some form of paranormal activity up here. But the sun beginning to set and twilight is falling over the fortresses walls and it’s a long way back down to the coach. This was the last night of the trip and we would be heading back to Bucharest for dinner at the Count Dracula Club. This is a Vlad the Impaler themed restaurant with an after dinner vampire show. Soon it’s back to the hotel as most people had a very early start to get back to the airport. On the final day of the trip while everyone else headed home I had decided to stay on a bit longer. The reason for this is that as I had come all the way to Transylvania I didn’t feel the tour would be complete without a visit to Targoviste which is the site of another of Vlad the Impalers castles and the location of what is probably his most famous atrocity. The tour director had found someone that would drive me there and it was only about an hour away from Bucharest. The castle and its grounds cover several acres and although much of it is ruins there is still a central tower you can walk up for a better view of what remains. It’s down below at the rear of the tower where Vlad the impaler impaled many of the 20,000 soldiers he had captured in his war against the Turks. This was done order to deter any further attacks. Gazing out over the castle you can’t help but recall the famous engraving of Vlad the Impaler eating his lunch surrounded by a forest of corpses. For some reason most of the Dracula tours don’t seem to include Targoviste on their itinerary but they should. If you really want to follow the Dracula Trail this is one of the must see places. The tour was now complete and tomorrow I would be heading back to the U.K. Normally I avoid organized tours but this is one that I highly recommend and I would consider doing it again one day. 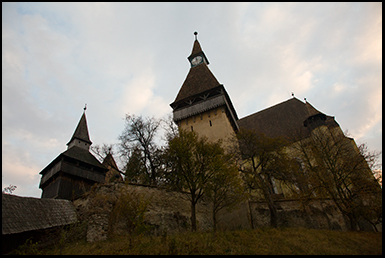 A trip through Transylvania in search of the legends of Vlad the Impaler and Count Dracula was in my top 5 paranormal bucket list and unlike many places I have visited, it not only lived up to expectations but exceeded them. Hey Buddy!, I found this information for you: "On the trail of Vlad the Impaler – In Search of Dracula". 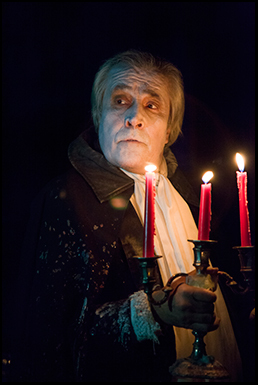 Here is the website link: https://www.chasingmidnight.com/vlad-the-impaler-in-search-of-dracula. Thank you.